Meeting rooms Boston-area businesses utilize can be located both in the city itself, but also conveniently accessible just outside the city. One of the great things about Boston is that so many facilities in and around the city are available, including meeting rooms. Many companies know, or are becoming more and more aware, how helpful it is becoming in today’s market to access such facilities. Rather than use up space in their own Massachusetts-area offices, many businesses are turning to meeting rooms in Boston area locations. The cost of these, compared to that of having a dedicated area located in your own facilities, is miniscule. The other major positive is the great impression that it provides to customers. A busy office rarely has the space to dedicate to such facilities in house, let alone the time. So, how does one go about it? The simple answer is to type ‘meeting rooms boston’ into a search engine and you’ll be astounded at just how many pop up. A quick visit to the venue to have a look around, and a discussion with their staff about the rooms and facilities provided, will soon set your mind at ease. Ideally, the venue should post numerous photographs of different meeting rooms in its facility that are available, so you can peruse them at your leisure even without visiting their location. Easy Access – Whenever possible, you should select a location close to one of the areas many freeways. Free Parking – Second, you will want to ensure there are plenty of complementary parking spaces available. Second, you will want to ensure there are plenty of parking spaces available. The last thing you need is to find out if your meeting conflicts with another of Boston’s thriving business community because limited parking spaces could mean attendees wasting time looking for a space. Fewer Distractions – Placing a meeting or conference well outside the downtown area makes it less likely that you’ll lose attendees…to the wide variety of interesting activities that downtown Boston offers (!). A suburban location can help keep the meeting on track and on time. All you need to do after having arranged the rooms is to collect your presentation material and make your way to the venue. Our staff will provide for your needs, even down to refreshments. You just need to set up for the meeting in the room itself and then greet your attendees. Additionally, state of the art audio/visual equipment is available, and videoconferencing can be arranged upon request as well. Many venues will charge extra for things like parking, A/V equipment rental, and the like. 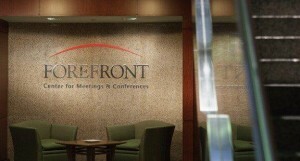 Forefront Center for Meetings & Conferences offers all-inclusive packages so that you won’t get hit with surprise charges after your meeting concludes (!). We strive to be “One-Stop-Shopping” for your meeting needs. When your event nears completion, why not treat attendees to the sights of Boston? Show them what a great and historic place the area is. Convenient nearby shopping at the Patriot Place Mall and Wrentham Factory Outlets make it easy for your meeting attendees, should they require any last-minute purchases. There are also excellent bars and restaurants nearby where you can sit back and get to know your client and really build customer relationships. You’ll be pleasantly surprised at the rewards that internet search for ‘meeting rooms boston’ will provide. And we all know that a happy customer is a profitable customer!